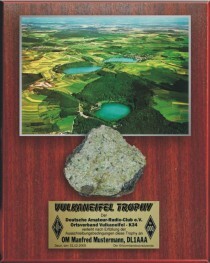 The DARC-Chapter Vulkaneifel (DOK K34) publishes this trophy on the occasion of his 25th anniversary for connections to local associations that fall within area of the “Volcanic-Eifel” (Vulkaneifel). The “Vulkaneifel-Trophy” can be achieved from all licensed radio amateurs and SWL's by having contacts after January 1st, 2001 with members of following local associations: Ahrweiler KØ1, Andernach K2Ø, Südeifel K31, Vulkaneifel K34, Obere Kyll K36, Cochem K45, Mayen K47, Mittelmosel K48 and (Bitburg K51). Each station counts only once per band. The trophy for a band or a mode may be issued with appropriate evidence. The trophy is supplied as a mahogany wooden plate (250x200mm) with a crystalline "olivine bomb“ into the plate. A metallic plate with a view of the central “Volcanic-Eifel” is also mounted. The trophy is personified by a serial number and with abundant information around the olivine. - Worldwide - please contact the Manager! The trophy can be obtained only with a confirmed listing of existing QSL Cards (GCR list).